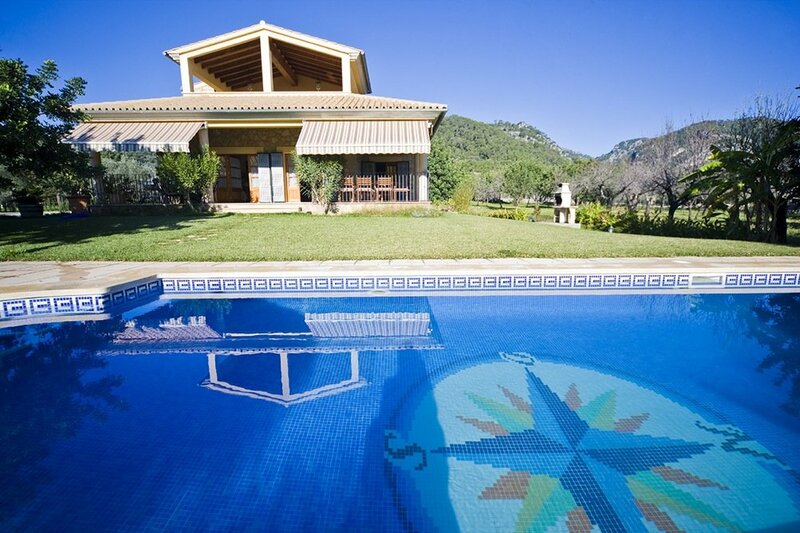 This beautiful villa is located just outside of the village of Selva and has sea views of Alcudia Bay. 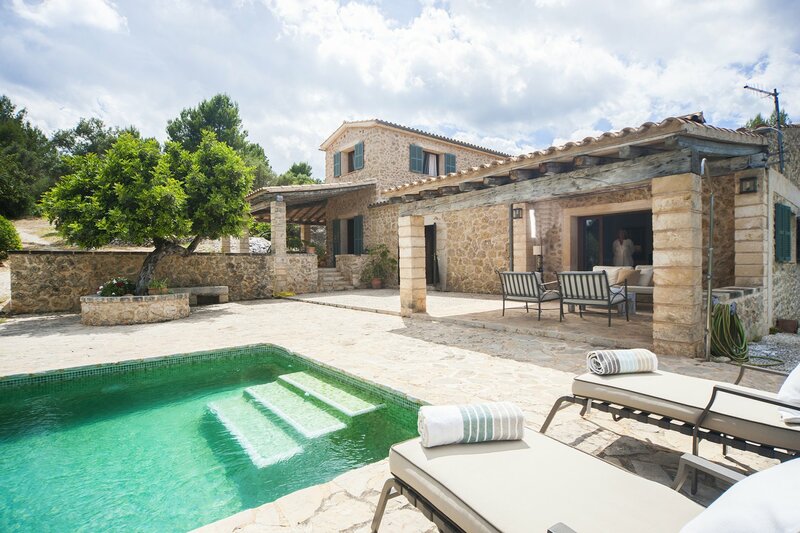 The 25.000 m2 private plot secure complete privacy and tranquility during your stay and the little village with restaurants and shops is only a minute drive. The house counts with 3 bedrooms and 3 bathrooms, 2 of them are en suite and located on the main floor. The 3rd bedroom is situated on the first floor and has beautiful views of the surrounding mountains and the sea. The views during the day, but also at night are breathtaking. When entering the house there is a magnificent entrance hall that connects the living room with fire place and TV to the kitchen with dining area. In front of the living room is a small covered terrace with out door lounge area that overlooks the swimming pool. Next to the kitchen is a second covered terrace with outdoor dining area and a lovely feature that is a natural little water stream dripping from a huge stone. 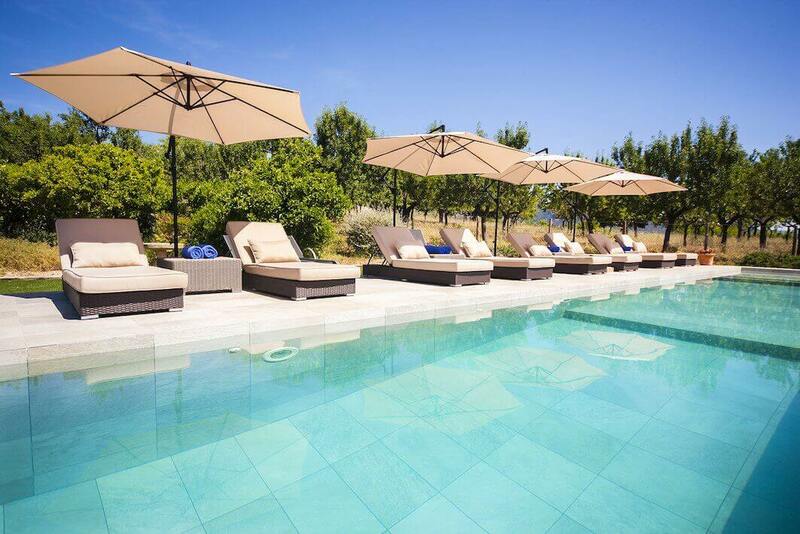 The beautiful swimming pool has a sun bathing area with 4 sun beds. All bedrooms have air conditioning and there is central heating for the colder months. The plot is fenced. This beautiful and tastefully decorated home is an ideal holiday villa with all modern amenities. Double bedroom with double bed 160 x 200cm, air conditioning and an en-suite bathroom with shower, WC, bidet and sink. Sea views!